I used a brayer inked with pale plum ink onto the Victorian A2 embossing folder by Cuttlebug before embossing the card, then using the same ink I stamped the penny Black footnote stamp at the bottom of the card. The Image stamp Charlotte was inked with Perfect Plum ink then I used a Koi Brush to draw the colour into the image. The ribbon was a find I made in a local haberdashery, it is kind of weird, it is and open weave lace cotton and is very soft to the touch. Oh, yes, Jak, simply STUNNING!!! And that ribbon -- WOW, what a find!!! 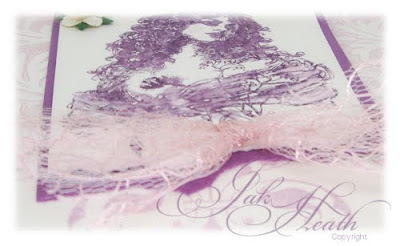 Gorgeous card Jak, just love the colour and that ribbon is just wonderful. OMG Jaf it's absolutely stunning!! An absolutely stunning card Jak, so very elegant and I do like this monotone look to it! Beautiful card Jak..Love the colours.. This is such a lovely card. Your explanations are so clear that I could even have a go at one.